The Largest Youth Soccer Club in the World. Rush Soccer, represents over 34,000 youth soccer players nationwide. Rush Soccer, represents over 34,000 youth soccer players nationwide. We are committed to the development of healthy youth through the game of soccer. With a firm belief in the value of sports in promoting the physical, mental and social well-being of our children, Rush Soccer is devoted to providing our members the finest soccer experience possible, teaching the fundamental skills of the game and developing athletes through organized leagues, teams, tournaments, training, coaches and athletic facilities. 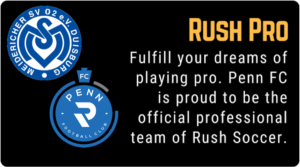 Rush Soccer is committed to making soccer a pleasant, safe, and rewarding experience for everyone involved, regardless of ability, and we believe that all players are winners because everyone is afforded an equal opportunity to explore their potential and pursue positive outcomes on and off the field. Rush Soccer was formed in 2002 under the leadership of the Colorado Rush Soccer Club in order to broaden the scope of its proven coaching, player development and administrative methodologies to a national level. By affiliating with qualified soccer clubs throughout the United States, Rush Soccer uses personnel, technical and intellectual property exchanges to create efficiencies through economies of scale, promote player, coach and tournament exchanges, develop proprietary information technology applications, provide administrative and technical consulting, streamline branding opportunities and maximize potential for fundraising and sponsorship support. Rush Soccer’s primary objective is to develop a national level club cooperative system that offers substantial opportunities for national corporate sponsorship and foundation support, provides the framework for a national coach and player development network, and will serve a significant centralized pool of talent for consideration by European, MLS, NCAA, US National and Olympic soccer programs. There are now more than 30 domestic clubs currently affiliated with Rush Soccer–in Denver, Virginia Beach, Albuquerque, Houston, Kansas City, Anchorage, Honolulu, Detroit, Boise, Memphis, Lexington, Philadelphia/Trenton, Bend (OR), Southern California, Orlando, Seattle, Atlanta, Des Moines, Little Rock, Madison, Bowie (MD), Atlantic City (NJ), Phoenix, New York City, Northern Boston, Dover (DE), Dallas, Southwest Connecticut, Los Angeles, Mississippi and Charlotte. Starting in 2009, Rush Soccer began expansion to International levels when it began a partnership with a small village in South Africa called Nkomazi. Since then, Rush has formed partnerships with a dozen clubs in Africa, Canada, Uruguay, Peru and Brazil in South America, Thailand, Tajikistan and India in Asia, New Zealand in the South Pacific and Mexico, Honduras, Haiti and the Bahamas in Central America and the islands of the Caribbean. In 2014, Rush partnered with their first club in Europe welcoming K-Town Rush in Kaiserslautern, Germany.